The album A Face We All Know by German avant-garde band Cassiber (with Heiner Goebbels on various instruments) includes four songs credited to Pynchon, all performed with a thick German accent: “A Screaming Comes Across the Sky,” “They Have Begun to Move,” “They Go In Under Archways,” and “A Screaming Holds” The second disc, remixed in 1997 by Ground-Zero, contains three versions of “Across the Sky.” Different versions of these songs, plus “A Screaming Holds,” also appear on Cassiber’s albums 1982–1992 (discs 4, 6, and 7), The Way It Was, and Live in Tokyo 1992. The latter also included “Come On! Start the Show!”, credited to Pynchon. Tim Ware told me that most of his electronic works listed here are inspired by Pynchon but that “At the Edge of the Wave-Green World I” is the most inspired. He also recorded an electro-acoustic piece with the same title, minus the “I”. Most of these were written in the mid-1990s when Tim was in Pynchon’s thrall. The Australian singer/songwriter/guitarist Robert Forster not only played the ferryman in Robert Bramkamp’s film Prüfstand 7 about Gravity’s Rainbow and the V-2 rocket, he also provided the theme song, an interpretation of the novel’s last song, the hymn penned by Tyrone Slothrop’s ancestor William. In 2003, novelist Meg Wolitzer and singer-songwriter Suzzy Roche teamed up to put excerpts of difficult books to music, among which, apparently, Gravity’s Rainbow. Although I have been unable to unearth more on this evidently quite humorous live project, the radio program reporting on it is still archived in the NYPR Archive Collections (starts around 33:00). Thank you, John K., for pointing this one out! According to Wikipedia, “Canadian experimental rock group Rei dos Leitoes’s song ‘Silent on the Island’ (2010) incorporates themes from Gravity’s Rainbow.” I was unable to verify this, but since rei dos leitões means King of the Pigs, it would certainly fit. Thomas Joel (see comments below) pointed this one out. He writes: “Singer/Songwriter David Arthur Brown is a self-expressed Thomas Pynchon fan and often alludes to his work via his band Brazzaville. Most notably the song ‘Soft Parade,’ from Morrow Bay (2013)” which goes: “Summer days remind me of the Soft Parade. Seventeen in L.A. and my heart kept breaking. 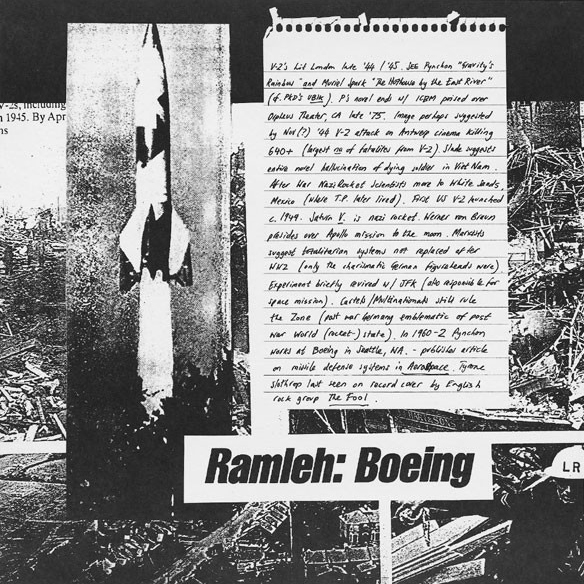 So long ago—road trips down to Mexico—with ‘On The Road’ and ‘Gravity’s Rainbow.’” Brazzaville’s songs “Boeing” and “Sleeping on Your Shoulder,” however, do not appear to have a Pynchon connection despite their titles. John Krafft pointed out this rock opera based on Gravity’s Rainbow but there is hardly anything to be found out about it on the internet – except for the full recording! 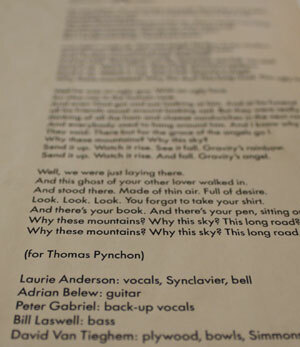 The nine tracks are adaptations form Pynchon’s songs and Pynchon is credited with the lyrics. Listen to it on The Fundament’s website. 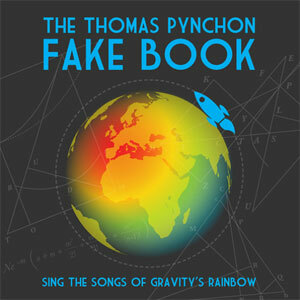 For myself, reading Pynchon is such a personal experience that I really prefer providing my own soundtrack. This is still a very interesting look at the quite wide influence that Mr. Pynchon ‘s work has had on musicians. I hadn’t realised how wide. My personal preference is Devo’s “Whip It”. It is direct and to the point without extraneous extrapolation. Just sayin’. Your preference for providing your own soundtrack for reading Pynchon is probably a feeling shared by many of the musicians on this list, I would think, which is why they did create their own soundtrack. Some of the above tracks and albums would still fit nicely into my reading. I enjoyed this very much and look forward to reading more. A lot of this was new to me and I will seek a lot of these recording out, particularly those which have tried to create songs from the books. One of my favourite things about reading Pynchon is when characters burst into song. Thank you, Mike, for these additions! Thanks also to John Krafft and Thomas for a good number of other suggestions! I added them all. Now I count about 95 entries, but still not a single one for Inherent Vice or Bleeding Edge. Anyone want to do a recording of Meatball Flag’s timeless surf classic “Soul Gidget”? Singer/Songwriter David Arthur Brown is a self-expressed Thomas Pynchon fan and often alludes to his work via his band Brazzaville. Most notably the song “Soft Parade,” from Morrow Bay (2013).